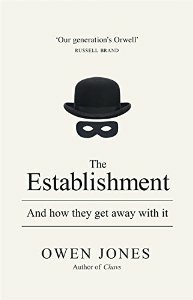 In The Establishment, Owen Jones argues that the establishment is not so much a group of wealthy people in cahoots to keep everyone else down, but rather a collection of people with shared beliefs who benefit from being able to influence each other. The establishment hasn’t remained stable over the years and those that are considered to make up today’s establishment are not the same as those following WWII. To start with Jones charts the shift in the political consensus from the 1940s to now. Once upon a time, free market ideology was fringe thinking and considered a bit barmy. Jones shows the methods by which more and more influential people were convinced by it’s proponents. It shows how money can be used to change people’s thinking. There are lessons there for those who wish to shift the political consensus back towards the centre, but the lesson is that money speaks and money corrupts. Jones looks at each of the groups whose members make up the establishment and shows how their interests align and complement those of the other groups. The chapter on tax avoiders was particularly illuminating. The involvement of corporations and huge consultancies in the process of writing legislation and regulation enables those corporations to manipulate the system in their favour. The revolving door between politics and business has serious implications for democracy. To be clear, Jones never claims this is a conspiracy. There’s no group of people sitting in a room somewhere cackling and stroking white cats. Much of this is the unintended and unexamined consequences of people pursuing their own interests. I found the discussion about ownership of the media and their relationship with their readers interesting. Papers don’t report what they think their readers want. They report what their owners and advertisers want. He shows (and he’s not the first) how the pressure to maximize profit compromises investigative journalism. The Establishment is a dense and lengthy read. I found it thought-provoking and stimulating and would recommend it to anyone interested in how politics works. I have always bought more books than I read, which has resulted in a bookshelf of unread books that I call book mountain. It is currently the smallest it’s ever been. Still some of the books on there have been in my possession for some time. 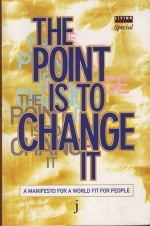 Such as The Point is to Change It which I must have bought fifteen years ago. Compiled from essays and articles first published in Living Marxism, this book examines trends in political life in the aftermath of the death of history. With the Berlin Wall down and the Soviet Block collapsed, how does the left respond to capitalism? The book was published in 1996 and, twenty years on, the world it talks about is depressingly similar to the one we currently live in. I can’t help but agree that the world needs to change. The tone of the book and some of the things that are conflated with social ills didn’t sit well with me. It’s presented as progressive and as suggesting solutions to the problems of capitalism. It doesn’t really do that. There’s a thick seam of nostalgia for some idyllic past when we didn’t waste our time with the women and blacks getting upset about trivial things, when we weren’t so soft, and valued self-confidence over victimhood. There’s a lot of privilege and entitlement in that kind of nostalgia. The values extolled are very much those attributed to white, straight men and denied to others. And there are no real solutions to speak of. There’s a manifesto at the back. It’s two pages out of two hundred and seventeen. It is mostly a rehash of the problems and lacks any call to action. Even if you did agree with the analysis (and there’s much in there that I do agree with once you detach it from the whining), you’d be hard pressed to know what to do about it. 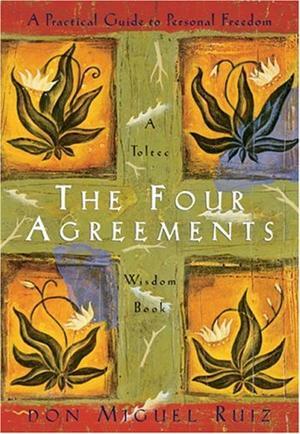 This book is the findings of a research project asking whether there has been a fundamental shift in Western cultures away from religion towards spirituality. The Spiritual Revolution posits that the decline in attendance at formal church services and in those describing themselves as members of congregations is matched by a rise in people describing themselves as spiritual and participating in what might be described as new age activities. The study also considered whether that trend might be reversed by looking at the demographics of the population studied. The study was conducted in Cumbria and some comparisons to the UK as whole are made. The most interesting part of the book to me was the discussion about how the decline of participation in traditional congregation mirrors the decline in all sorts of associational activities, such as trade unions, professional institutions and political parties. I’ve worked for organizations that rely on committees of volunteers for a while now and the factors described in this book are very much at play. It gave me a different perspective on what’s going on. I’m not sure what I’ll do with that yet, but I feel it’s important to know. 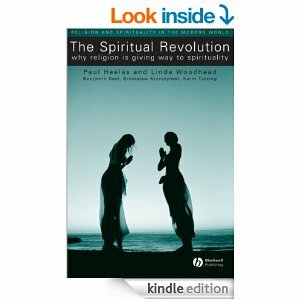 The Spiritual Revolution is the published findings of a study conducted by Paul Heelas, Professor of Religion and Modernity, and Linda Woodhead, Senior Lecturer in Christian Studies, from Lancaster University. If you’re interested in the subject and prepared to tackle some fairly dry text, then it’s worth a read. Talking about the Elephant by Lupa is an anthology of essays on neopagan perspectives on cultural appropriation. The essays cover various paths from Celtic Reconstructionism to Egyptian mysteries to eclectic paganism. Cultural appropriation is where members of a dominant culture take sacred aspects of another culture and appropriate them for aesthetic purposes. A good, and recent, example is white people wearing traditional American Indian headdresses. Each feather in a warbonnet means the person wearing did something. It’s like wearing medals you didn’t earn. Members of the tribes of American Indians are very vocal about the appropriation of their sacred rites, such as dream quests and sweat lodges, and the people who use them without understanding the culture. They make the very valid point that religion is about community and you can’t separate the practice from the life. Neopagans draw from any religions going – including the dominant Abrahamic religions – and they do it with the full range of motivations. Some neopagans are all about community and some are all about the individual connection with the divine. These essays are from people practicing various paths and talk about their experiences of cultural appropriation. In many cases, that means working through a rationalization for doing whatever you want and not feeling guilty about it. There is an interesting discussion about academic bias and lots of tidbits about various traditions and where symbols are derived from. While the essays are engaging and, I believe, genuinely try to tackle the issue, this anthology feels like it failed to get to grips with it. I don’t know what the answer is here. I understand the desire not to give up the objects and activities that you’ve become attached to and have a connection with. I also feel that’s it’s not enough to say, well it’s ok to violate the living culture of a people who have been colonised and are still experiencing oppression so long as you do it respectfully. Maybe, the answer is to address the social issues that make cultural appropriation so harmful. 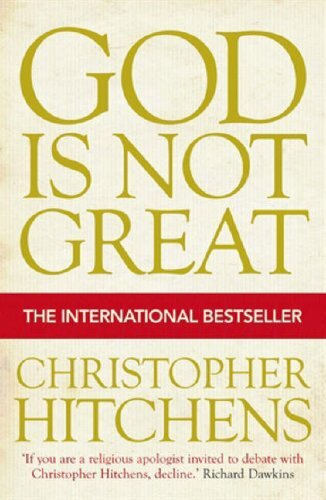 I don’t think I would have read God is not Great by Christopher Hitchens if it hadn’t been in the 99p kindle sale at Christmas. Maybe that was someone’s idea of irony. The premise is that not only is there no god, or any other creative consciousness, but also that organized religion is mad, bad and dangerous to know. Using personal anecdotes, documented history and analysis of texts, Hitchens takes us through more than a dozen reasons why religion is bad for your health and probably makes you a less moral person. I thoroughly enjoyed it, but I can’t say I had my point of view changed. I came to the book already primed to agree with Hitchens’ points. Partly because his arguments are based on a Marxist critique of religion and partly because I’ve read the Bible and came to many of the same conclusions myself. The one thing I did learn is that the Buddhists aren’t all they’re cracked up to be. Not as peaceable as you might think. If you believe there is a God, especially one of the Abrahamic persuasion, you are unlikely to have your faith shaken. Hitchens goes in for grandstanding much more than persuasion, and I would think his tone would inspire defensiveness and rebuttal. I’m sure it would get my back up. Unfortunately, the same is true if you’re undecided. 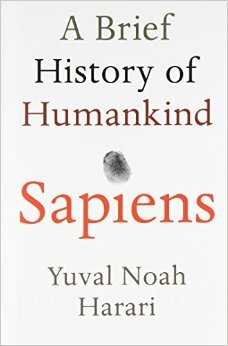 This is not a book that will commend a god-free enlightenment to you (for that, I’d recommend Towards the Light by A.C. Grayling). If you are an atheist (and I am, for all my flirting with animism/paganism), then this is a rallying cry for the cause and really good fun. Recommended or not recommended depending on your starting position.